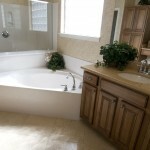 When it comes to bathroom flooring, there is little better than stone or ceramic tiling. While it is often seen as something only a professional can do, it is actually fairly simple to do yourself, and it can cost as little as $300 to complete. To complete an effective tiling job, you must first begin with the base. If you now have vinyl or concrete flooring, it is recommended that you leave it in. If you have a wood subfloor, though, you will probably have to install backer board over it. You also need to determine both floor thickness and joist spacing before setting down tile, just to see if you need backer board or not. If the joists are spaced 16 inches apart, then add 1.125 inches of backing. If they are 24 inches apart, then add 1.5 inches. Along with the backing tile, you need to remove any remaining cushioned vinyl that may have been left there. It cannot support rigid tile as it is too spongy. Make sure that you receive specific advice from the tile store staff with your floor design in mind. 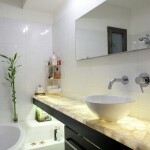 Remove the toilet and the vanity if you plan to replace it during the tiling process. Also, remove the baseboard or plan so you can add a base shoe moulding. Because you are raising the floor, you must mark the door with all of the required layers.Clean the floor with vinyl floor stripper, then insert screws through the floor to connect with the joists. Ensure that there are no open pipes or loose materials.Use screws and a thin-set adhesive to set up the backer board on the floor. You will need to cut the board into staggered pieces. Make sure there is a bit of space between the back and the walls. After the layer of backer is installed, you need to determine a proper layout. Do not begin by putting a tile in one corner, as some walls may be crooked. Centre the tiles so that you can later place half- or quarter-pieces. Centring the full pieces will give your bathroom a fuller look. Using wood planks is an effective way to divide the floor. Setting the tile is a two-part process. First, you must set down the full tiles. After lightly dampening the bottom of the pile, spread thin-set across it. Press down firmly on the tiles so that they remain in place and remain flat. Make sure that the thin-set does not dry out. The final major step is grouting. Once all of the tiles are set down, you will need to set up the toilet flange’s extension ring. Once fastened, grout between the flange and the tiles to avoid any leakage. Wait at least 24 hours, then use a grout float to spread the group diagonally across the tiles. The joints should be packed tightly with grout. Clean the tiles to avoid staining. Dry weather will cause the grout to harden, so begin sponging and scrubbing it off the tiles almost immediately. You should consider purchasing a grout sealer to apply the next day when you will apply caulking and install the proper appliances.